You would say I’m still a boy, if you ever see me trying to catch the train’s window seat. The world outside it still manages to keep me enthralled throughout the journey. The other day, I was visiting Dahanu as per my work schedule. 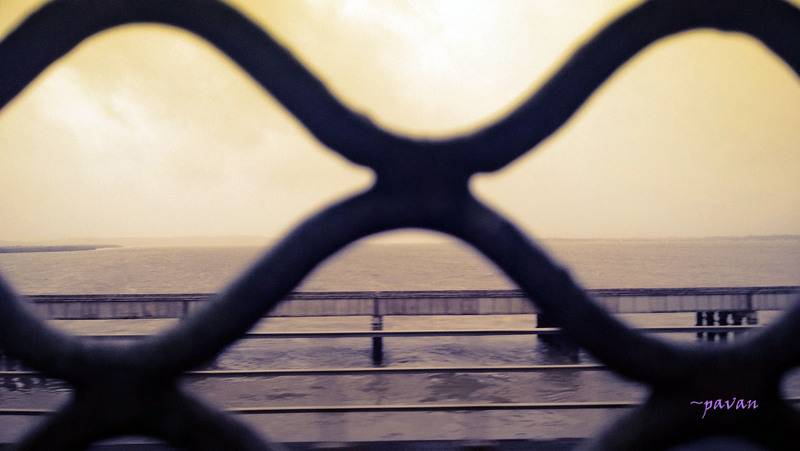 It was the last stop in Mumbai, almost kissing the Gujarat border. It would take me not less than 2 to 3 hours to reach there. But I had no complaints. The train crossing the river bridge and making da-da-dum sound always kept me engaged in conversation with her. It was monsoon and lush green lands on the both sides getting sliced by a river was a charmingly bucolic sight. It was well garnished with a row of mountains holding hands far behind the lands. Fishermen could be seen taking their motorized boats filled with fishing nets and an anchor. None of them ever seemed bothered by the rhythmic movement of train wheels through their town. Maybe the train knew only too well how to march in tune with those tiny villages. There were only few stops where passengers could get down and hop in at. Umroli was not one of them. I think the little town wasn’t particularly happy about being left out. It looked morose watching the train speed past its old crooked platform. It was always deserted except for few dogs, elderly men and a tea seller kid. The tea seller kid. The first time the boy caught my attention was, when he raised the tea kettle indicating he hoped to serve us. The train didn’t have time for the little boy and kept racing ahead. Next time I saw him again standing there and yet again the next month as I passed that station. I think the boy started to recognize me then, watching me study him. He started smiling at me. I didn’t smile back. I wanted to buy a cup of tea from him. But the train wouldn’t let me. All I could do was to watch him stand there in shorts and a surprisingly clean white shirt. I wondered if he learnt about cleanliness at a school. And then immediately I hoped that he does go to school in the first place. I tried guessing how much he would be earning by selling tea in that little town of his. It became a routine for me. Few months passed. I had not been to that part of town. I had forgotten about the tea seller in my errands of work life. It was raining heavily the day I was once again on my way to Dahanu. I was excited. I was hoping to see him again. I wondered if he would still recognize me. The train moved slowly that day for whatever the reason it was. The river was laughing its full mouth with rainwater and only few fishermen could be seen. I looked outside as the train approached Umroli village. The platform seemed even more deserted today. I could spot not more than 3 to 4 people. They didn’t include that boy. The barricade behind the platform was broken and was hanging down. Platform was submerged in water. “What happened to this place?” I exclaimed. “It got flooded. A huge flood that swept away this and nearby towns” said the fellow passenger. “Bad enough for few people to go missing. Almost all of them lost their houses”. “Hmm” I sighed and retreated back into my thoughts. The journey seemed unusually long that day. I was trying not to think about the tea selling boy. I reached Dahanu. I met my client. I changed the topic every time he spoke about the horrible flood. He offered me tea and I found it difficult to gulp it down. On my way back, the train again moved at slow pace due to water on the tracks. Just a station before Umroli, a tea seller got into the next compartment. For a moment I thought he was the same boy. He wasn’t. I knew I was not going to get down at Umroli someday, even if the train did stop. Although I thought about it several times. I don’t know what happened to him. Maybe I will never find out. But I’m a sucker for happy endings. In my story, he did survive. He reunited with his family. I would like to believe that he even found a little puppy dog. Yes, I would like to think so.